Our May 6th meeting was the first to be held at our new home, Alberta Abbey. It is a lovely venue which is big enough to accommodate our rapidly growing membership! Our swarm hotline by Honey Bee Allies is up and running, and very active! To report a swarm call (503) 444-8446. Members can register to receive swarms, or to be a swarm mentor or mentee. If you’re interested, register at Bit.ly/pubswarmlist. PUB will be hosting a photo and art contest. If you’re interested, start taking pictures or creating your art projects, and stay tuned for further submission details. Judging will take place at our annual winter honey tasting event. Our Education Committee is requesting donations of fun educational materials. There’s a request for bee or flower hats, games (such as a beanbag toss), an a photo cutout stand. Additionally, we’d like to start collecting samples for an entomology display. Tour de Hives will be taking place on June 20th. PUB is still looking for hosts and assistants. If you’re interested in participating, please volunteer at bit.ly/TourVolunteer2015. At the meeting, Glen Andresen gave his monthly pollen and nectar report. Speaking of Glen, Dewey Caron wrote a lovely article on Glen in Bee Culture this month called, “Beekeeper, Gardner, Teacher: Glen Andresen.” Tim Wessels, our former PUB president, gave a presentation on “What to do in the Hive This Month”, where he spoke mostly of swarm control and supering. We proceeded to gather for breakout sessions, divided by beekeeping experience. We had large groups of new beekeepers, which is very exciting! Our monthly meeting on April 1st came with some exciting announcements! First, our new swarm hotline is now live! We’ve partnered with Honey Bee Allies. They have created a swarm list tool for us that will be available to our membership. We will be retiring our old swarm list. To be a part of the PUB swarm list and take advantage of our new hotline (503 444-8446) for swarm notifications, register at bit.ly/pubswarmlist. Glen Andreson gave his monthly pollen and nectar report. With this early spring, most of the fruit trees have finished blooming, and the great bee plants haven’t started blooming just yet. To see a full report, visit BridgetownBees.com/whats-in-bloom/. Carolyn Breece gave an enthusiastic presentation on the Oregon Master Beekeeper Program, a collaboration between Oregon State University and Oregon State Beekeepers Association. It’s an exciting intensive beekeeping program, designed to support beekeepers at all levels. It starts with the Apprentice level, where beekeepers are matched with master mentors to support their learning in the field. Students can continue their training and education at the Journey level, and finally if a student completes the whole program, they will become a Master Beekeeper. Certification is available, but not required to participate. Many of the mentors in the Portland area are PUB members! 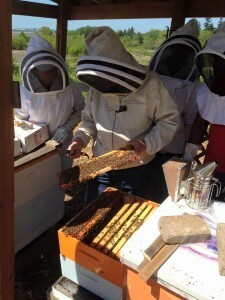 For more information on the program and how to get on the waiting list, see OregonMasterBeekeeper.org. Dewey Caron presented findings on last winter’s survey results. To participate in this winter’s survey, visit pnwhoneybeesurvey.com. This survey helps us share information and continue to develop best practices for overwintering bees in our unique Pacific Northwestern climate. Additionally, he gave his monthly “What Is Your Plan” presentation, where he reminded us that April is “the cruelest month.” As overwintered adults die off, and brood ramps up, the hive can be left in a vulnerable moment. He predicts that the early spring this year will mean a big beekeeping season, and some special practices might be interesting to try, such as opening the brood area to the supers to alleviate crowding. He reminds us to set out bait hives and be sure to have extra boxes and frames ready for the big swarm season upon us!